How do I log in to Appspace Cloud? How do I activate my Appspace Cloud account? Where do I download the Appspace App? How to access the Appspace API library? What do I need to know about the Appspace Free Account? How do I sign-up for an Appspace Free Account? I am unable to sign up for an Appspace Free Account. What can I do? What are the password rules in Appspace Cloud? 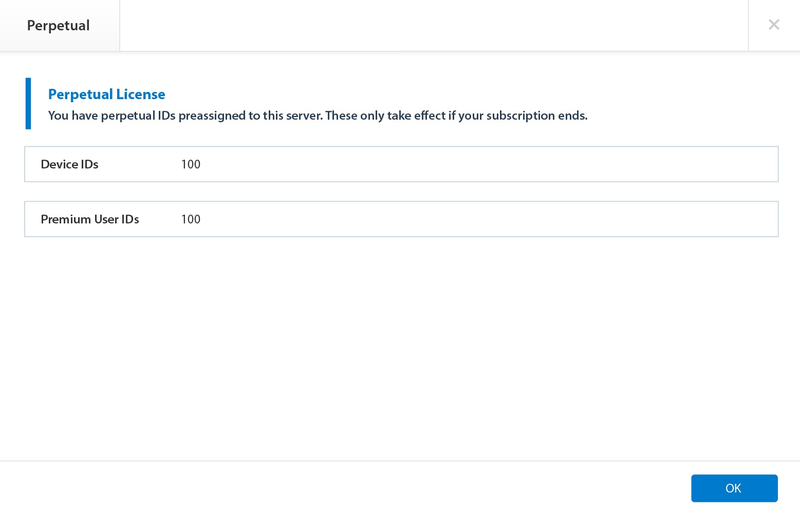 The new Account Management Portal enables Cloud Services Account Owners to directly access Appspace subscription and licensing information, without having to log in to the Appspace console, via our new cloud-based site at https://account.appspace.com. You only need your Appspace Cloud Services Account Owner credentials to log in. The Account Management Portal is only accessible by the original Account Owner of the company account. Users who were invited into Appspace and assigned the Account Owner role in the console will not be able to access this site. If you are unsure and unable to access, please contact Support. The Account Management Portal also allows you to license Appspace on-premises servers, and define Device ID and Premium User ID allocations, based on your subscription plans. If you are using Appspace 6.1 and earlier, you must install the Appspace License Manager before proceeding to license your on-premises server. The Appspace License Manager is a standalone tool that enables customers running older versions of Appspace (below 6.2) to continue to be able to license those servers. By installing and running the Appspace License Manager, the license keys that are generated from the Account Management Portal will be automatically translated by the tool when applied to the server. The following illustrates the layout and interface of the Account Management Portal. The Overview tab displays company name and registration number, billing contact information, and plan information. The plan information section displays your subscription type, subscription validity dates, storage and bandwidth information, as well as the number of IDs purchased with your plan. Further below, resource usage and cloud ID usage are graphically displayed for ease of view. These graphs will be updated according to current usage statistics. In an OMNI Free account, billing contact information is not available. All other features on this page described below are not available. The License Management tab consolidates subscription, and perpetual license management. Again, a Global ID Usage graph is displayed here. Online (green) - Displays when a dynamic server is successfully checked-in during the scheduled sync, or when cloud-integration is enabled on a static server. Offline (grey) - Displays when a dynamic server fails to check-in after the 6 hour-scheduled sync, or when cloud-integration is disabled on a static server. On an Appspace Cloud account, you will not be able to register and license a new server. The REGISTER NEW SERVER button will not be available, and only the cloud server will be listed. In an OMNI Free account, only the Global ID Usage graph is displayed. The option only appears if you have a perpetual license included in your subscription plan. 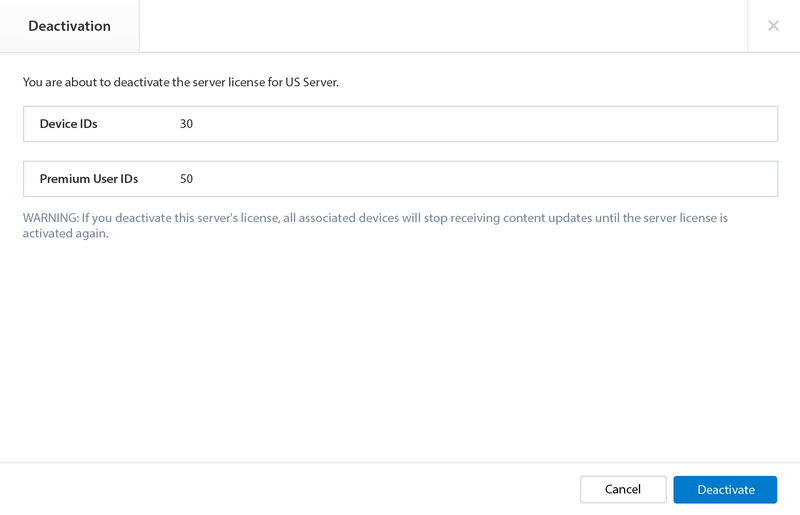 The server’s Device and Premium User IDs can be increased, or decreased by updating the server license. You can only increase, or decrease both the ID types at any one time. You cannot increase one ID type while decreasing the other, at the same time. 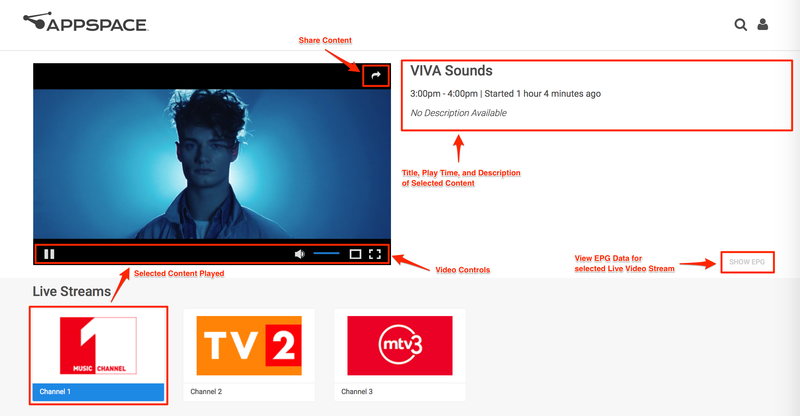 The Perpetual tab only appears if you have a perpetual license included in your subscription plan. This option becomes available if you had not completed the last step of your license activation. You will be able to continue with the activation. 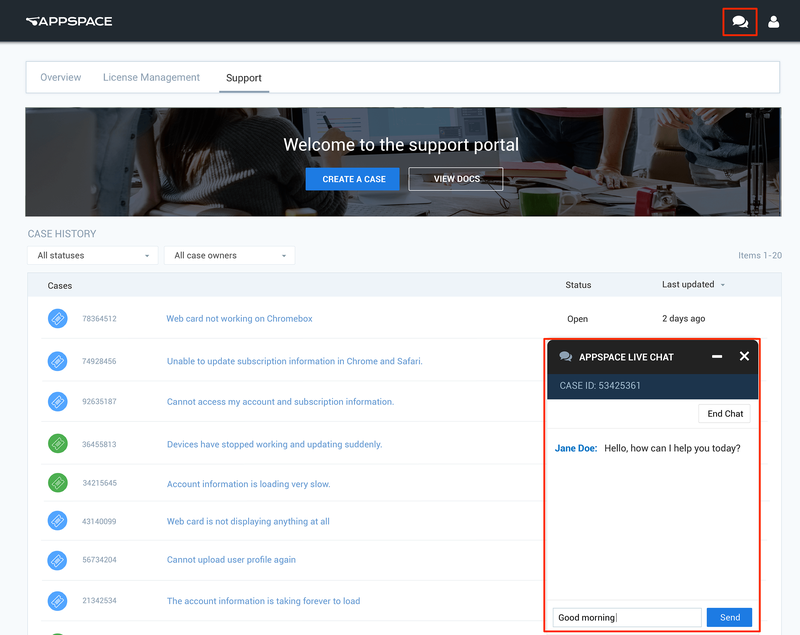 The Support tab in the Appspace Account Management Portal, allows Cloud Services Account Owners to create and manage their own support tickets. Case History - View support ticket history. 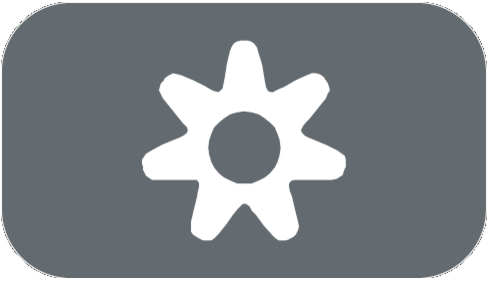 This page also has a button to create new support tickets, and a button to access the Appspace Knowledge Center. You can view all the cases that you created via this portal or through the phone, including open and resolved tickets. Cases are automatically sorted by “last updated” first, and can be filtered by status. Create Case - Create support tickets via a simple and easy form. You can include an attachment (all file types) per new ticket. Case View - View case activity for each case. You can interact with the Appspace Support team by adding comments or uploading attachments. However, the comments cannot be edited, or deleted once you save it. Only the Appspace Support team may resolve or close a case. You can upload one attachment for each comment you make for a case. All file types are accepted for an attachment. The Permissions tab allows Cloud Services Account Owners to grant specific users access to the Support Portal. Cloud Services Account Owners are able to view all cases, and have the ability to filter cases based on the case creator. Users, whom are non-Account Owners, but have access to the Support Portal have the ability to create, view, and manage cases that they created themselves. The Billing tab enables Cloud Services Account Owners to view all available Appspace subscription plans, and review their current billing and subscription. Live Chat is part of Support’s latest offering to paid subscription customers, that allow Cloud Services Account Owners and users with access to the Support page, to communicate directly with our support teams via the Account Management Portal. Live Chat can be accessed from the navigation bar, or invoked through a case thread when discussing the case specifically. 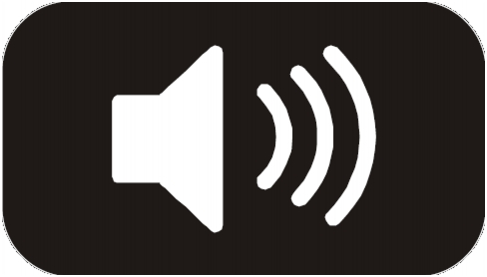 When active, the Live Chat window is displayed throughout the Account Management Portal, and a transcript is generated once the session is over. Support personnel can create new cases based on a chat session, if the chat session isn’t related to an existing case.